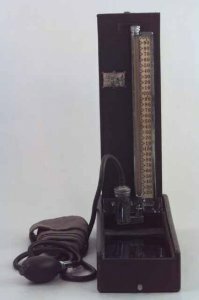 1940's Mercury Sphygmomanometer in black lacquered case. A black rubber bulb is attached via approx 50cm black rubber tubing to a 12.5cm inflatable cuff, which is attached by approx 80cm tubing to a chrome-plated U-tube manometer with a scale from 0 - 300mm Hg. The bulb contains two one-way valves. The valve at the free end allows air to enter. When the bulb is squeezed, this valve closes and air is propelled through the second one-way valve to the cuff. When the pressure in the cuff increases, mercury moves from the reservoir into the scaled column up to the appropriate level. Between the bulb and the cuff is a third valve which allows the cuff to be deflated. Mercury sphygmomanometers similar to this are still in use today. The cuff is wrapped around a superficial artery (usually the brachial) and inflated using the rubber bulb. The high pressure in the cuff is transmitted to the artery, which eventually collapses, inhibiting blood flow to the lower arm. The air in the cuff is slowly released, lowering the pressure. When the pressure falls to just below systolic pressure, the artery opens slightly, allowing blood to flow for a short time until the arterial pressure falls below the cuff pressure and the artery is occluded again. The high velocity, turbulent flow produces vibrations that can be detected by a stethoscope, and the pressure on the manometer at the point when the sounds are first heard is determined to be the systolic blood pressure. As the pressure is lowered further, the opening time of the artery becomes longer with each cardiac cycle until the flow becomes laminar and the sound stops. The pressure on the manometer at this point is identified as the diastolic pressure. The pulse pressure is taken as the difference between the systolic and diastolic pressures, while the blood pressure is expressed as systolic pressure over diastolic pressure.